Companies knew as early as 1918 that asbestos was dangerous. But, the asbestos companies, the insurance companies, and other companies that put asbestos in their products conspired to hide the truth from the American public. 1918: Frederick Hoffman, a medical statistician for the Prudential Life Insurance Company, reported in a United States Department of Labor Bulletin that American life insurance companies generally deny coverage to asbestos workers because of the "assumed health-injurious conditions of the industry." 1922: Louis Dublin, a statistician for the Metropolitan Life Insurance Company, writes that asbestos workers are at risk of injury to the lungs. 1930: One major asbestos company, Johns-Manville, produces a report, for internal company use only, detailing the fatalities and medical injuries of asbestos workers. 1932: A letter from the United States Bureau of Mines to asbestos manufacturer Eagle-Picher states, "It is now known that asbestos dust is one of the most dangerous dusts to which man is exposed." 1933: Metropolitan Life Insurance Company doctors find that 29% of the workers at one Johns-Manville plant are suffering from asbestosis. Johns-Manville settles lawsuits by 11 employees on the condition that the lawyer for the employees agrees that he will not bring any new actions against Johns-Manville. 1934: Officials at Johns-Manville and Raybestos Manhattan, rewrite an article about the diseases of asbestos workers written by a Metropolitan Life Insurance Company doctor to minimize the danger of asbestos dust. 1935: Johns-Manville and Raybestos Manhattan instruct the editor of Asbestos Magazine to publish nothing about asbestosis. 1936: A group of asbestos companies agree to sponsor research on the health effects of asbestos dust, but require that the companies have complete control over the disclosure of the results. 1937: Roy Bonsib, Chief Safety Inspector for the Standard Oil Company of New Jersey, documents illnesses such as asbestosis and analyzes the dust-creating potential of installing and removing asbestos insulation. 1937-38: The Industrial Hygiene Digest at the Industrial Hygiene Foundation includes 2 articles about industrial types of cancer by workers working with asbestos. 1942: An Owens Corning corporate memorandum refers to "medical literature on asbestosis... [and] scores of publications in which the lung and skin hazards of asbestos are discussed." 1942-43: The president of Johns-Manville says that the managers of another company were "a bunch of fools for notifying employees who had asbestosis." When one of the people in attendance ask, "Do you mean to tell me you would let them work until they drop dead?" According to deposition testimony, the response was, "Yes. We save a lot of money that way." 1944: Metropolitan Life Insurance Company finds 42 cases of asbestosis among 195 asbestos miners. 1944: The Journal of the Medical Association reports that asbestos is one of the "agents known or suspected to cause occupational cancer." 1948: The American Petroleum Institute's Medical Advisory Committee, whose members include oil giants, received a summary of a paper in which the chief pathologist for E.I. DuPont De Nemours & Co. suggested that the industry "aim at the complete elimination of the exposure" to asbestos. 1951: Asbestos companies remove all references to cancer before allowing publication of research they sponsor concerning exposure to asbestos. 1953: National Gypsum's safety director wrote to the Indiana Division of Industrial Hygiene, recommending that acoustic plaster mixers wear respirators "because of the asbestos used on the product." Another company official notes that the letter was "full of dynamite," and urges that the letter be retrieved before reaching its destination. A memo from those files notes that the company "succeeded in stopping" the letter which "will be modified." 1964: Dr. Irving Selikoff publishes a study in the Journal of the American Medical Association, proving that people who work with asbestos containing materials have an abnormal incidence of asbestosis, lung cancer, and mesothelioma. 1989 and 1991: In 1989, the United States Environmental Protection Agency bans asbestos and most of its uses, but, in 1991, asbestos companies win a federal lawsuit which overturns the EPA's asbestos ban. 1999: The Florida Supreme Court rules that Owens Corning willfully withheld information about the dangers of working with the company's asbestos products. The Florida Supreme Court describes it as a "blatant disregard for human safety involving large numbers of people put at life-threatening risks." The actions by these companies are just a small sample of the many actions by companies using asbestos that did so in disregard of the safety of their employees and other innocent victims. 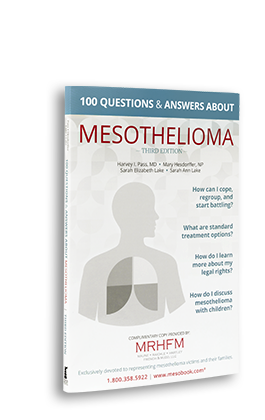 If you have mesothelioma and wish to discuss your legal options with an attorney, CLICK HERE.